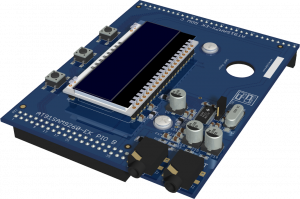 The Calypso add-on is an audio extension with LCD for the AT91SAM7X-EK and AT91SAM9260-EK evaluation boards from Atmel. The extension board was developed in co-operation with Atmel and is part of the AT91SAM Internet radio application note. Audio extension with LCD for Atmel evaluation kits AT91SAM7X-EK und AT91SAM9260-EK.